The first tour gives us the opportunity to see the mountains from all points of the compass. We start with a climb to Mala Upa, a good road that climbs from approx. 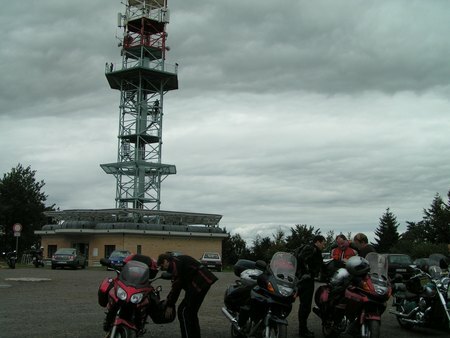 640 meters ASL (above sea level) to 1060 meters ASL (2000 - 3500 feet), then we cross the border into Poland. This road is good and is fun to drive, but the best is yet to come. Further on, we pass through small villages such as Kowary, Sciegny, Milkow, Sosnowka and Podgorzyn eventually arriving at Szklarska Poreba. Szklarska Poreba is one of the biggest summer and winter sports areas of Lower Schlesien. The town lies between 440 - 880 meters ASL (1400 - 2800 feet), has 8000 inhabitants and offers over 5000 guest beds. Surrounded by majestic hilly countryside with picturesque waterfalls, there is a well-planned network of walking trails thet attract the visitors during the winter as well as the summer months. If wished, we can make a stop here so you can take in the tourist attractions. A little further on waits a spectacular left curve, very sharp, and is an accident black spot. 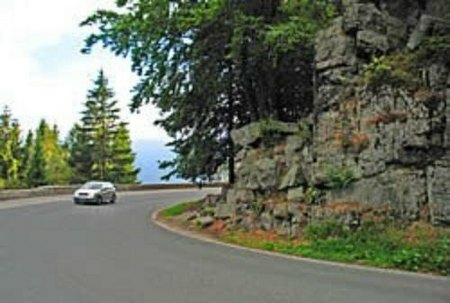 However, this curve offers a magnificient view of the Hirschberger Valley. Directly after the curve is the start of the old Sudeten Road, which takes us through Swieradow, and back to the Czech Republic. The border crossings aren't much these days. Because of the European border agreement, they are unmanned. 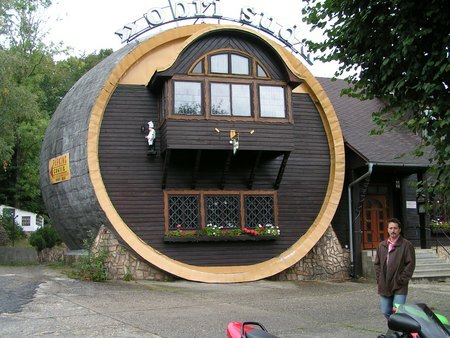 A short run from the border brings us to the Giant Barrel of Obri Sud. We have here the opportunity to sample the Czech cooking, or just take a few photos, or even both. After the culinary and cultural stop, we go further on to Hejnice, where we turn left through Bily Potok to the start of a road that is the exact double of any road through the Alps. This road takes us up to the ridge of the Iser mountains, and at Wittighaus we can slake our thirst. Further on along the ridge we come to a dam with reservoir that waters the town of Liberec. Shortly afterwards, we join the E65. This road is full of curves, is almost as wide as a motorway, and is a favourite of the Czech "jet pilots", who use this road to scrape their knee protectors away. 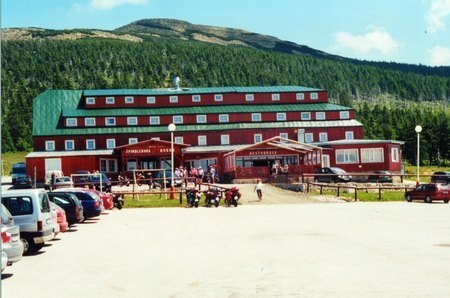 Later, we make a right turn at the Hotel Motorest, where a short visit is strongly advised. When we reach the connecting road 290, we use this to reach the main road 14, where we make a right through Vrchlabi, Lanov and Cerny Dul, and back to Pec pod Snezkou. Altogether a nice ride with wonderful scenery and views of the Krkonoše Mountains area. This tour (as well as the others) was completely ridden by us, and is really worth doing. The tour starts with a run through Horni Masov, Janske Lazne and Cerny Dul to Vrchlabi, where we take the first right at a roundabout (good practice for our English friends). After 3 km (2 miles) we make a left towards Benecko. This is off-route, but is worth it because this small but good road leads us to a viewing point with a fantastic view. The Parish of Benecko was first mentioned in the annals in 1628. Legend has it that it was founded by Benes, an immigrant Benediktiner Monk. He had a curious travelling companion - a stag. This explains the town's heraldic symbol, a stag's head with a cross between the antlers. 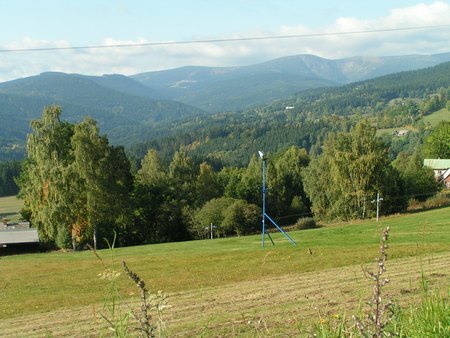 From Benecko one has a view over the Iser mountains and across to Jested in Liberec. Here is also the first chance to eat and drink. 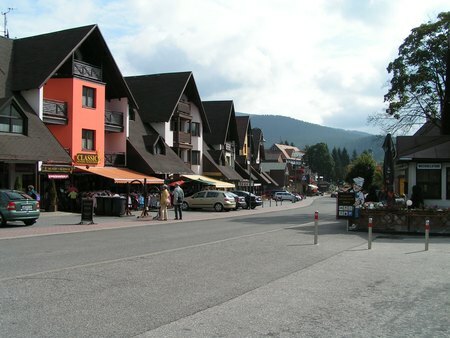 Back on the main road we ride directly to Spindleruv Mlyn, a famous and well-loved winter sports area. To get to the Spindlerbaude, we have to use a toll road, which costs 100 Czech Crowns (about 4€). Worth the price, because the following serpentine is really enjoyable. Arriving at the top, we have a wonderful view of the neighbouring mountains (Reifträger, Schneekoppe etc.) and in the vally of the Spindler Mill. After a short pause to stretch the legs, it's back downhill and off towards Vrchlabi, where we make a left towards Strazne, previously called Pommerdörfl in the annals of 1754, although in the second half of the 17th century mining took place here, with a miner's village, ore hammers and crushers. Legend falsely has it that the name come from a founder from Pommern. However, the correct history has it that the name comes from the action of hammering and crushing the ore. Sometimes, one feels as though one has been transported in an old but modern fairytale. We see ancient wooden houses next-door to modern villas. A bit further on we join the main road at Lanov, then back to Pec pod Snezkou. This is the shortest tour, 140 km (88 miles), and a riding time of around 3 hours. We start with a run through Horni Masov, Cerny Dul, Vrchlabi to Hrabacov where we take a right at the roundabout towardsVitkovice and Rokytnice. The history of Rokytnice goes back to 1574. Today it is a favourite holiday area, especially in winter. When we leave this place, we join shortly the main road 14. We follow this to the north, alonside the small river Jizera, till we reach a big junction, where we make a right towards Harrachov. Harrachov's history goes back to the 17th. century. A glassworks was built here in 1712, around which a (then) new village was built. 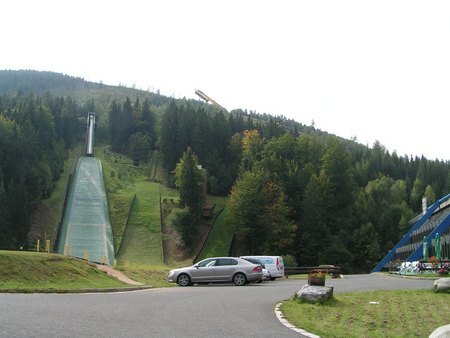 It was officially designated a town in 1973, and has developed into the most important Czech skisport centre, with one of the few Skijumps in the world. As one would expect, there are many large and small shops and restaurants - ideal spot for a break. 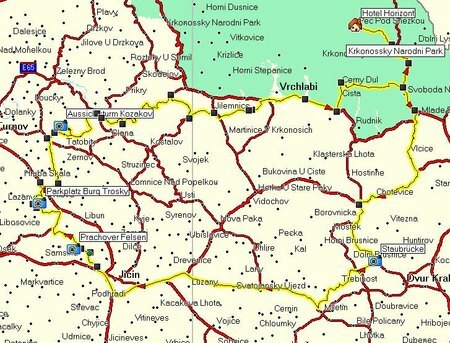 A bit further on from Harrachov we cross the border into Poland, then it's not far to Szklarska Poreba, which is very similar to Harrachov. We ride through using the well-built trunk road E65, but we don't stop on it very long, because we soon make a right towards Karpacz. This road takes us through the forest tp our next stop. The bikes can be parked on a manned carpark, and if we ask nicely we can leave our jackets and helmets here. A short walk takes us to the Wang church, which was built in the middle-ages (12th. century). 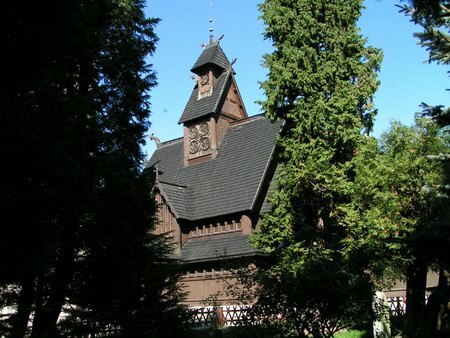 It originated in Vang, in Norway, and in 1841 was taken as war booty by the Prussians, and rebuilt in Brückenberg near Krummhübel (today part of Karpacz). No iron or stell nails were used to construct the church. 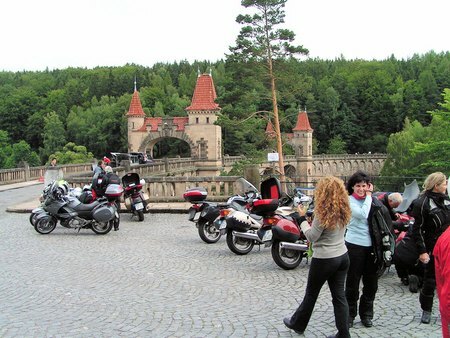 When we leave Karpacz, we ride many kilometers uphill to the border crossing at Mala Upa. We are now at 1000 meters (3300 feet), then it's a nice curvy ride downhill back to Pec pod Snezkou. Distance 160 Km (100 miles), riding time about 3 hours. 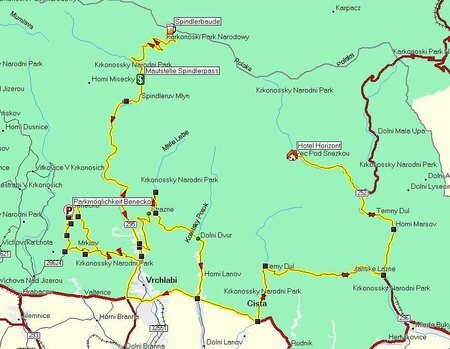 We start by riding towards Mlade Buky, where we take a right onto the main trunk road 14, only to leave it after a short run, turning left onto the connecting road to trunk road 16. We then drive to Vestrev, and turn left onto the 325. In Debrne we leave the 325 and make a left onto the 299. After around 7 Km (almost 5 miles) we reach our first stop, the dam at Les Kralovstvi on the upper reaches of the Elbe, which serves two purposes - flood water retention and hydro-electricity generation. The dam, with it's two late-Gothic archways is architecturally interesting, and in 1964 was declared a historical monument. The next town we reach is Jicin, but to avoid driving through we use the new by-pass, at the end of which we turn right and use small roads till we reach the visitor's hut at the Prachover Felsen. If wished (and one has good legs), one can stop here and do some sightseeing. However, it takes about two hours, but we have enough time for a short stop. A bit further on we see for the first time the imposing view of the Burg Trosky. Built around 1380 on two basalt rock formations, the smaller tower is called Baba (Grandma), the higher slimmer tower carries the name Jungfrau (Virgin). At that time impregnable, the castle resisted many attacks, only to be abandoned in the 17th century. The ruins became popular with the late-romantic artists and poets of the 19th century. Today it is a tourist attatraction, and from the Baba tower one has a wonderful view of the surrounding countyside - in good weather one can see as far as the towers in Prague. 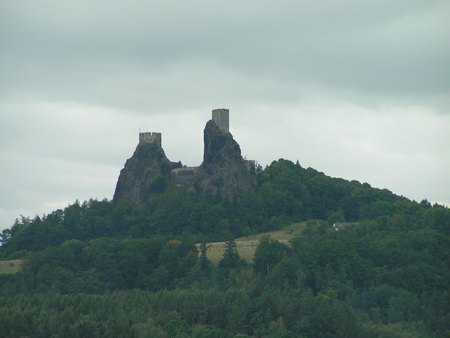 One has a fantastic view over the Bohemian Paradise, Giant Mountains across to the Isergebirge. Directly next to the tower waits our mid-day meal in the Restaurant Riegerova. 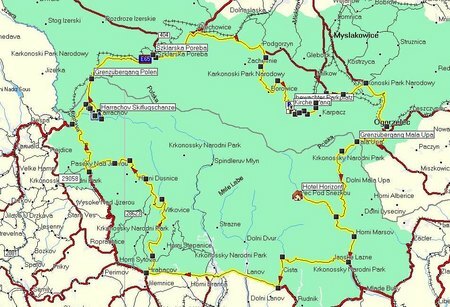 We then ride to Semily, where we follow the river Jizera, and shortly before Vrchlabi we turn onto the main trunk road 14 to Cerny Dul and Pec pod Snezkou. Altogether a long but very interesting trip with many sights. Total length of the tour is about 187 Km (117 miles). Driving time 4 hours without stops.